a&o Graz Hauptbahnhof i Graz, Austria: Bestill nå! The a&o Graz Hauptbahnhof opened in spring 2013 and enriches the beautiful city on the Mur with its modern rooms and charm. Guests can book a single, double or family room. Our many shared rooms offer comfy beds and separate shower and toilet in the room. We look forward to welcome you at our Styrian newcomer! 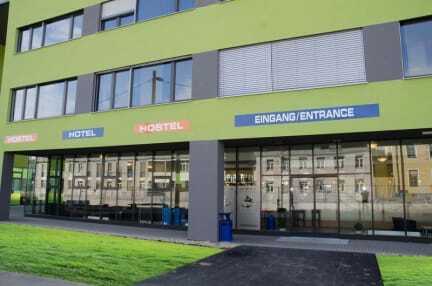 The a&o Hostel Graz is located just 100 meters from the main train station and is ideally suited for all arrival possibilities. The close proximity to the train station makes trips to Styria quickly possible. The city of Graz invites guests to discover its sights by foot or bike. The newly built a&o Graz Hauptbahnhof is worth a visit in itself, as the Skybar on the roof of the building lets you discover the whole beauty of the UNESCO awarded city while enjoying a well-mixed cocktail or delicious cup of coffee. The lobby is the place to be if you like to hang out and meet nice people.